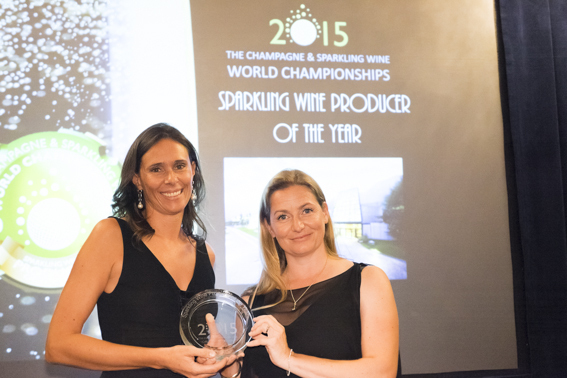 Ferrari wins the title of “Sparkling Wine Producer of the Year” at the international competition The Champagne and Sparkling Wine World Championships 2015, prevailing in the final round over two renowned Champagne producers: Charles Heidsieck and Luis Roederer. This impressive achievement adds itself to the prize awarded to Ferrari Perlé 2006 Trentodoc as Best Italian Sparkling Wine and the nine gold medals won by the Trentodoc wines produced by Ferrari, from Ferrari Maximum Brut to Giulio Ferrari Riserva del Fondatore. While the first edition of the competition crowned Ferrari Perlé 2007 as World Champion Sparkling Wine Outside Champagne, the prizes awarded this year commend Ferrari Trentodoc as a Metodo Classico able to compete with the best Champagnes in the world, providing further proof of the extraordinary vocation of Trentino and its mountain viticulture to produce excellent sparkling wines. This international acknowledgment comes a few days after Ferrari was nominated for The Best European Winery by Wine Enthusiast at the Wine Star Awards, the prestigious prize that the American magazine will hand out at the end of 2015. In the photo Camilla Lunelli, head of PR and Communication, with Master of Wine Essi Avellan, one of the judges.